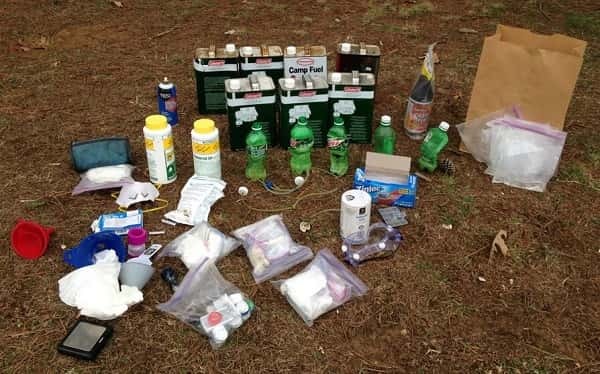 BENTON – A home visit with the Cabinet for Families and Children led to the arrest of a Benton couple today after narcotics detectives discovered active meth labs at a local residence. According to police reports, Marshall County Detective Don Tidwell was called to assist Social Services workers at a residence on Crooked Oak Loop. While on the porch, Detective Tidwell observed two meth generators. A female subject opened the door and allowed for Detective Tidwell and Social Services to come in. As Detective Tidwell entered the residence, he observed a strong chemical odor present in the home as well as a male subject and four year-old child located. Upon further search, Detective Tidwell discovered meth generators, reaction vessels, six bags of liquid meth, coffee filters, pseudo pills, lithium batteries, salt, funnels and Coleman fuel in the bedroom. The female subject admitted that methamphetamine had been manufactured in the home earlier in the morning. Fort-two year-old James W. Collins and 38 year-old Christy Jones, both of Benton, were arrested and charged with Manufacturing Meth 1st Degree, Controlled Substance Endangerment to Child, Possession of Controlled Substance 1st Degree and Possession of Drug Paraphernalia. Both Collins and Jones were lodged in the Marshall County Detention Center.